This page is for the updated version. 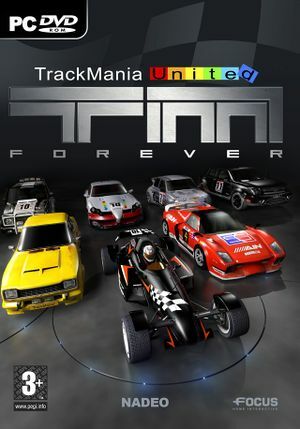 For the original release, see TrackMania United. Free upgrade for owners of TrackMania United. Contains new features such as all seven environments from previous games and an all-new mediatracker. Includes an optional CD-key for Online play. Update 2010-03-16 updates the game to the latest version. Graphics settings are stored in the GfxDevicePerfs.txt file. The profiles folder stores all configuration information and preferences. The tracks folder stores all tracks along with any custom tracks. The scores folder stores all medal information and race data. Listed as > 4:3 (large). Text and other display objects will stretch. GUI elements are severely stretched. Only supports resolutions up to 1280x960. Can be toggled with Alt+↵ Enter. No FPS or refresh rate limit. Every input is remappable in the profile settings. Mouse not used in gameplay. Only available in-game through player's profile. Any DirectInput or XInput device is supported. The game does not have voice acting. Peer-to-peer is used to download other players' skins and horns. ↑ 1.0 1.1 File/folder structure within this directory reflects the path(s) listed for Windows and/or Steam game data (use Wine regedit to access Windows registry paths). Games with Steam Cloud support may store data in ~/.steam/steam/userdata/<user-id>/7200/ in addition to or instead of this directory. The app ID (7200) may differ in some cases. Treat backslashes as forward slashes. See the glossary page for details.